In the end, there is The Word.... 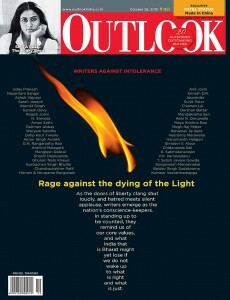 It falls upon writers to float an ark of reason in the flood of intolerance in Modi-led India. Mumbai—under siege from the Shiv Sena’s puerile jingoism—is no longer a cosmopolitan safe haven. The BJP-Sena spat over recent events is only a new eyesore. Kiran Nagarkar, one of the most significant writers of postcolonial India, on the current atmosphere and its political underpinnings. BJP president Amit Shah who is possibly facing his toughest political test on the Bihar Elections. A prudish I&B plans to restrict condom ads on TV, but will it defeat the purpose? The institutional tripod of the State has become an unstable arrangement on two legs. Articles 75(5) and 164(4) must go. Have the new adoption guidelines complicated matters further? Mobile wallets are the new big players in the transactions push. And it’s clicking. The Tata Mumbai Literature Festival, the Delhi International Arts Festival and boiling the perfect egg. There is a multi-billion-dollar weight-loss industry preying on a simple fact—fear and confusion about what to eat. The iconic Smita Patil would have been 60 this week. A new biography traces her life, her untimely death and her glorious, meteoric career. Excerpts. Modi is caught in the pincer of a paradox—his RSS-fed hankering for a Hindu rashtra and his own modern technocratism. Where will his balancing act lead India? The first Jamaican to win the Booker prize and Rushdie's unafraid form. Just like the ‘Railway Mutton Curry’ of yore, it is difficult to get the authentic dhaba chicken any more. Forsyth’s real life story is more thrilling than any yarn he ever spun for us! Gupta has a stellar cast, but loses out on this adv­antage with his slipshod direction.